Kaunonen, Gary, and Aaron Goings. 14 Michigan Copper Strike and the Italian Hall Tragedy. Press, 2013. 304 pp. $29.95 (paper). 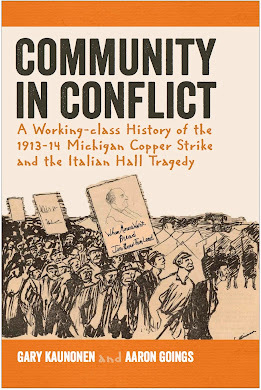 If you asked participants in a labor history classroom today how many of them know about the 1913–1914 Michigan copper strike and associated Italian Hall tragedy, chances are not many hands would go up. If they had heard of it, they are unlikelyto be aware of the full details of the labor war that occurred a hundred years ago in what is known as Copper Country, Michigan. That’s where Community in Conflict comes in. Authors Gary Kaunonen and Aaron Goings set out to restore “the working-class majority to center stage of the region’s history” (p. 243). And they largely succeed, uncovering new and overlooked sources that take us intimately close to the work and social lives of the mine workers and even closer to their struggle with mine owners and bosses. For some workers, the strike—“an epic showdown between organized labor and monopoly capital”—was about union recognition and better pay (p. 3). For others it was about class war and revolution. The bitter struggle also revealed the strength and political commitment of the many immigrant groups—Finns, Italians, Croatians, and others—that had migrated to Michigan’s Upper Peninsula only to be confronted with racism, maltreatment, and employer/owner attacks. Ultimately the strike bankrupted the Western Federation Miners and sent this founding affiliate of the Industrial Workers of the World (Wobblies) into decline. The Italian Hall Tragedy, “as horrible as any in the history of American labor” (p. 1), resulted in nearly eighty people, most of them children, being trampled to death when someone yelled “Fire” in the Italian Hall in Calumet, Michigan. Primary among the authors’ tasks in reviving this history was to uncover concrete evidence establishing what actually happened and to contextualize the events without succumbing to what the authors call provincialism. Helping them achieve their goal was the availability of non-English-language sources such as the Finnish and other ethnic labor press. For example, they quote liberally from Tyomies, the Finnish-language publication associated with the Finnish Socialist Federation in Hancock, Michigan. The authors also present firsthand coverage of events through the Miners’ Bulletin and the Wage-Slave, also published in Hancock. They examine coverage from several mainstream newspapers as well, showing the bias that often colored coverage of miners’ strikes. Kaunonen and Goings add value for labor educators by revisiting the lives of some of the labor movement’s most famous personalities and explaining their roles during the strike. Wobbly leaders Big Bill Haywood and Mary “Mother Jones” Harris, for example, make an appearance in strike-bound Copper Country. Others include famed lawyer Clarence Darrow, socialist leader Eugene Debs, and social activist Helen Keller. These are familiar names. Not so familiar are the private detective agencies that were hired as strikebreakers, or the companies that specialized in hiring scabs. The Pinkerton, Thiel, Waddell-Mahon, and Ascher agencies, as well as lesser-known ones, harassed radical trade unionists, ethnic minorities, and socialist politicians. Less familiar still will be the many labor spies that mining companies employed to undermine the union movement and foment dissent during periods of labor strife. As the authors note, “The best lens into the lives, work, and rebellions of the Copper Country mineworkers comes to us through the reports of the labor spies” (p. 93). With meticulous attention to detail, the authors have constructed a community labor history written with passion and purpose. There is much political zeal here, to be sure, as well as open sympathy for the strikers and the victims. But there is also much solid scholarship that offers a factual base for arguing the cause of those workers in defending themselves from ever-rapacious capital. Community in Conflict is a credible new tool suitable for the labor educator’s teaching kit. It is one that will inspire further curiosity about the often hidden labor history of the United States.